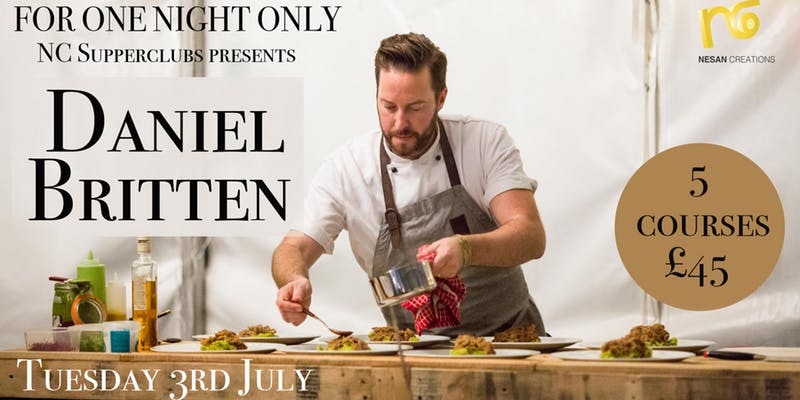 NC Supper Clubs is bringing chef Daniel Britten to Clapham for one night only on Tuesday 3rd July with a 5 course feast celebrating seasonal produce. The menu includes a main course of Lamb Rump, and a cheese course featuring Norbury blue cheese, and takes place in The Treehouse, the dining space above the Clapham North pub opposite Clapham North station. "Passionate about local produce Daniel won Surrey Life's Food and Drink Award for Best Local Menu in 2015 he was also runner up for Chef of the year that year. Daniel's career took off when he reached the quarter finals of BBC’s MasterChef in 2008. This inspired him to achieve his ambition to become a chef, gain a Cordon Bleu Diploma at Tante Marie Culinary Academy in Woking and fully immerse himself into the culinary World of a professional kitchen. Venturing out into the restaurant industry, Daniel gained invaluable experience from some great head chefs and has never looked back. Currently a chef of "no fixed abode" his company Britten For Food brings Daniel's exciting talent to NC Supperclubs for an exclusively designed contemporary British menu."